Create a Christmas ornament with your miniature with adding a gold cord. The classic façade of Santa Maria Novella, in Florence, provided the blueprint. There's so much to love about the vintage nativity at left — the small scale, the fine art, that lovely embossed "Glory to God in the Highest!" banner. 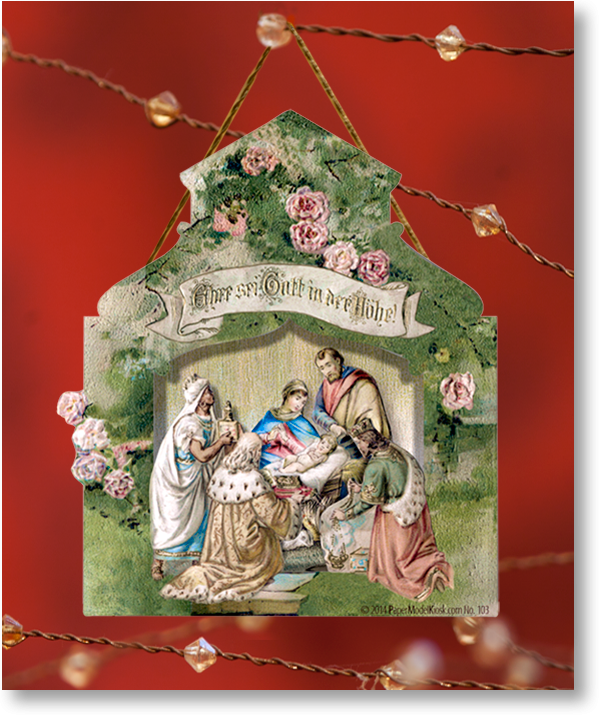 Actually, it's printed in German, Ehre sei Gott in der Höhe!, an added flourish of the German artists who created this little masterpiece of the crèche designer's art. What gave me pause was the bad shape of this fold-out nativity: tears, stains, candle wax meant a couple of days of restoration. But that i could live with. What I couldn't was its odd shape: asymmetrical I can live with. But uneven? It looked like someone had taken an X-acto knife to the poor thing. Surely, this façade needed a bit of work. I began by pruning and rearranging the roses, moving the Gloria banner, and filling in the Santa Maria Novella façade outline with my Photoshop paintbrush. The only thing I haven't resolved quite yet is which do I love more? This charming paper nativity or it's glorious name? The Santa Maria Novella Miniature Nativity Combo includes a Premium Download and a Printed Sheet. Two layers mean ease of assembly. Add a gold cord and turn it into a Christmas ornament. Step-by-step instructions included. Size: 3 x 3.75 x 0.5 inches.